Very pretty bracelet with an expensive look. I'm glad I made the purchase for my daughter in law. She absolutely loves it ! I love that it looks as expensive as Tiffany's. Its very light in weight but has somewhat of a heavy look to it. Great purchase. I would purchase again. 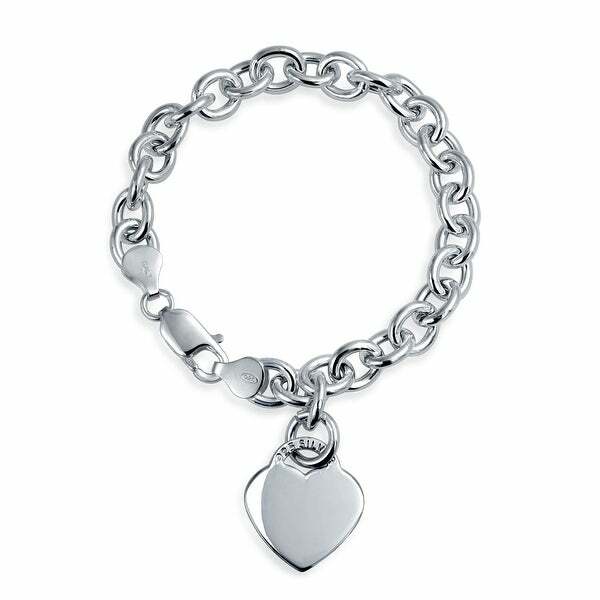 Introducing our charming Silver Heart Tag ID Charm Bracelet. This lovely yet heart bracelet is finely crafted by .925 sterling silver. This trendy yet affordable identification bracelet features a sterling silver heart tag linked to a chain bracelet, that is engravable with any message you want to put on it. This beautiful bracelet can fit a 7.5 inch wrist size, and will get the crowd falling in love with your fashionable look. This remarkable jewelry piece will make you look chic and unique with its personal style, and is also a great present for Valentines day, Mothers day, or for anyone on your holiday gift list. I like this piece but it is smaller in width than other 8 inch bracelets I own. It's very pretty... Just very snug with little room to dangle. I think it's a beautiful piece of jewelry. "What is the largest size do you have"